Family Pet Expo at The Meadows Casino - That Guy with the Birds! July 12th-13th Family Pet Expo at The Meadows Casino! Wrapped up a great weekend at the Family Pet Expo at the Meadows Casino & Race Track! Thanks to all that stopped by to visit the birds! 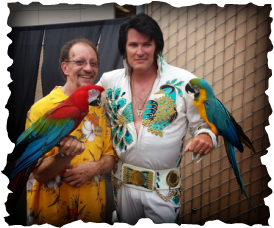 Alvie, Gunner & John got their picture taken with Elvis!! Special thanks to Bob & Dottie from Clicker Shows for having us! As Elvis would say......Thank you.....Thank you very much..
Pictures of the first day! Pictures from the 2nd day!